The target backer for the original Target Meister portable target stand. 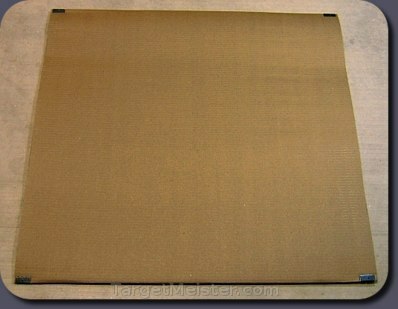 Single-sided, corrugated cardboard with four mounting brackets on each corner of the backer. You can sail up to 1,000 rounds through this backing before needing to replace it. Of course, it depends on your caliber, groupings, and utilization of the backing's surface area. The cardboard backing includes reinforced mounting hardware that helps firmly anchor the backing.